Skerries; originally a small fishing village has despite it’s growth in recent years retained it’s small town charm and beauty. Skerries has so much to offer the visitor, the wonderful harbour area with it’s fishing boats (Skerries is a major landing port for Dublin Bay prawns), yachts, seals, sailing club, bars and seafood restaurants – a hive of activity. 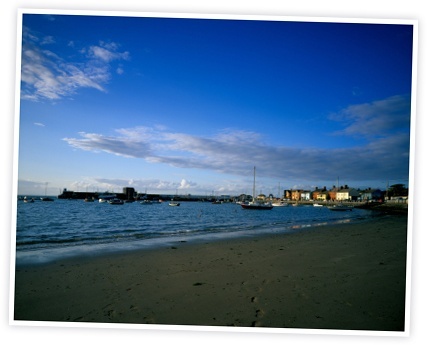 Skerries has beautiful beaches, a stylish town centre with cafes, bars and shops. Add to this a host of visitor attractions and activities from Skerries Mills, Martello towers, Ardgillan Castle and gardens, Baldongan Castle, superb walks, swimming, fishing, kite and wind surfing, sea kayaying, cycling, bird watching, playgrounds, we could go on and on! Pick up a picnic at Season’s on the main street and set off around the head or to Ardgillan Castle. Go crab fishing with your children on the rocks at The White Cottages. Check out the seal activity at the end of the pier when the fishing boats come in. Have prawns pils pils, chicken wings and pints at Blue Bar on the harbour road. And don’t worry ladies – plenty of retail therapy – boutiques, beauty parlours, coffee shops, arts crafts and interiors down town! Killalane Motorbike road races Sept.
Skerries (Irish; na Sceiri) comes from the norse (Viking) word Skere which has descended into Hiberno-English as Skerry meaning a small coastal island, a Skerries being a group of them. Skerries has five islands off it’s coast, these are ; Shenick Island, St. Patrick’s (Church Island), Colt Island and Rockabill (which is two islands, the Rock and the Bill). There is also Red Island which despite it’s name is actually a tombolo. Rockabill has the largest numbers of breeding Roseate Terns in Europe. It is also the furthest away from the town and has a lighthouse. On Shenick Island can be found a Martello tower, one of a number of defensive towers erected during the Napoleonic era along the Irish coast by the British. Red Island also has a Martello tower. When Saint Patrick was expelled from Wicklow by the pagan natives he sailed northward and landed on a small island off Skerries. In his honour it became known as Saint Patrick’s island. When the saint arrived on the island he was accompanied by a goat which provided milk. From this island Saint Patrick would come to the mainland to convert the people. While Saint Patrick was ashore one day the people of Skerries visited the island and stole his goat, took it back to the mainland and ate it! When he returned he was furious and bounded with a great leap from his island to Red Island (there is an indentation in the rock which is supposed to be his footprint). He questioned them and when they denied it he took away their power of speech, so that they could only bleat like goats until they eventually admitted their crime. 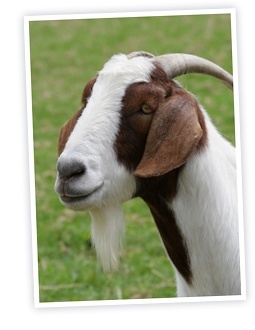 To this day, people of Skerries are often referred to as Skerries goats!